This version of the classic Spyhunter game is a GBA port of the console version released recently on Playstation 2. 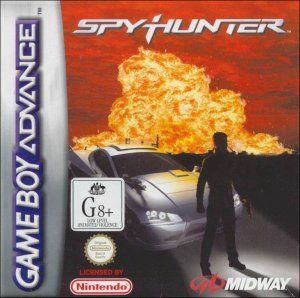 I was dubious at first when receiving the title as most times GameBoy Advance conversions end in tears, however Spyhunter impressed no end and it is evident that a great deal of attention to detail has been given. The story will not set the world on fire with the only hints on the box being that the evil Nostra Corporation is out to cause havoc, however once in game you will release that there is a bit more to it than that. Everything about this title rings class, from the very beginning of the game with it's slick intro movie comprised of stills from the console versions of the same game. I was impressed with the quality of the graphics in the intro and the Peter Gunn theme that accompanied it. The really cool thing is your car, which is what the game is really all about. 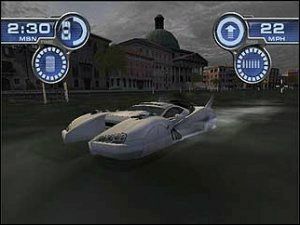 It is called the G-6155 Interceptor and the unique thing about your vehicle is the ability for it to morph into a number of craft including a jetski, boat or high powered motorcycle. As it evident from the screenshots on this page, this is one very fine looking game. 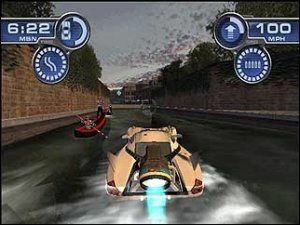 The framerate kicks long very nicely and the developers have had the vision to include a number of nice touches including reflection effects when on the water. Before you can get started, you will have to undertake a gruelling test level where you have to complete objectives before moving onto the missions proper. This include things such as dodging barrels, shooting targets and activating beacons. Basically demonstrating an ability to control your vehicle. In addition to all these features, this game sounds absolutely brilliant and has many great sound effects incorporated. Music is appropriate and adds to the overall feel of the game. Midway have included a two player option for the game as well, available through the use of the link cable. Your cars can then do battle to your hearts content. As well equipped as your car is, the distance behind the car is limited and you might not get to see all the goodies that you can unleash though your opponent certainly will. 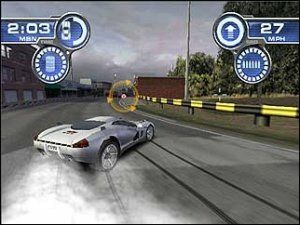 The game plays fantastically and the car handles like a dream. Scenery rushes by and the menu system is so well designed, it borders on intuitive. There are voice samples included that tell you if you pass or fail a mission adding even more class to the title. In summary, Spyhunter is a title that will do both Acclaim and Midway proud and would be a great addition to your cartridge collection.